Up here in Vermont, we’re under a rare heat advisory because they’re expecting temperatures to be around 95 degrees today and tomorrow and the heat index to be between 100 and 104. 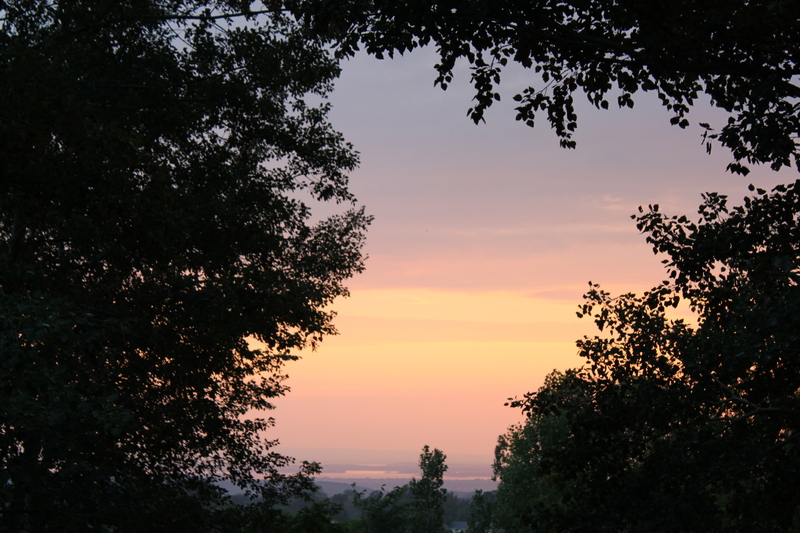 A hazy sunset over St. Albans, Vermont on July 5, 2010 as a big heat wave began. Seems like things stop or slow down in Vermont in this weather more so than during a winter storm. In the winter, the snow is an excuse to go out and play. Now, in this hot weather, the recreation paths are empty, people are not out for strolls on city streets, the outdoor tables at the restaurants are empty, and people who are outside seem to be moving in slow motion. The beaches are pretty busy, but it’s really too hot even for the beach. That sand is so hot, even if the water is nice and cool. Mark Breen the meterorologist at the Fairbanks Museum and Planetarium said this morning the weather is like a Harlequin Romance: Hot and steamy. But that’s not quite right. Romance novels are all about passion. Bad passion, maybe, but passion. Gasping for air in this heat and humidity isn’t exactly passion. And hugging your lover in this weather means you’ll probably just stick together in an unpleasant way. And besides, even lovers get crabby when it’s hot, so they won’t feel like hugging anyway. Still, I like these rare, big heat waves because they are indeed rare in Vermont. It gives a taste of what it’s like to live in Houston. It’s fun to vicariously visit there for a few days during a heat wave, but I’m sure glad I don’t live there all the time. When a cold front finally comes through (they’re saying Friday night) the lower temperatures and humidity will make us all breathe a sigh of relief, and make us really appreciate normal, temperate Vermont summer weather. This entry was posted on July 6, 2010 at 2:56 pm and is filed under Uncategorized. You can follow any responses to this entry through the RSS 2.0 feed. You can leave a response, or trackback from your own site. But Houston has air conditioners!!! We don’t!